Suppose an insured claims a burglary occurred and valuables were stolen in the amount of $10,000. Would an insurance investigator think of ulterior motives for the money? Would an SIU investigator think of searching pawn shop records to find the very same items in the claim were pawned? Well that’s exactly what happened in the scenario mentioned above. The RAPID LP portal developed by Business Watch International enables an investigator to enter the claim details item by item into a police-hosted pawn shop records database. Any hits in that database on matching property descriptions, or serial numbers are forwarded immediately to law enforcement for investigation and eventual insurance fraud charges to be laid. All this is accomplished while at the same time not violating any pawn privacy laws or police-confidential data. By empowering law enforcement with this information, insurance companies will achieve the goal of preventing insurance fraud and at the same time the possibility of criminal charges will deter future attempts at fraud. 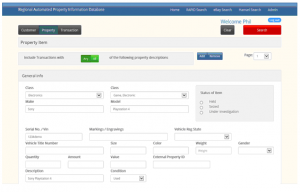 RAPID LP also has an eBay search portal, where investigators can search for property claims to see if they were or are on eBay. Of course you can also access Harmari Search through the RAPID LP portal as well. Contact us today for a demonstration of RAPID LP.